Gezigt van den Iagang van Chequetan, of Seguataneo leggende N.O. op een asstand van 5 Eng. Mylen. / Gezigt van den Ingang van de Haven van Acapulco. 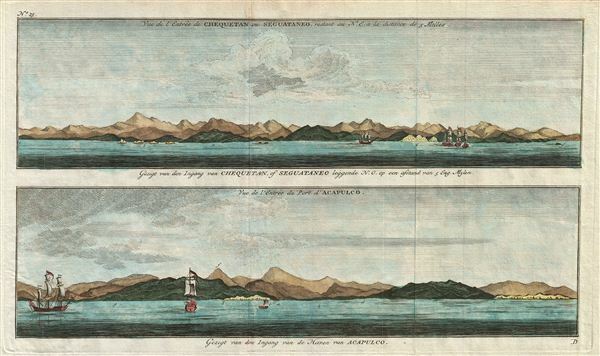 A pair of appealing 1765 nautical views of the Mexican harbors of Acapulco and Zihuatanejo by George Anson and Jan van Schley. These shore profiles include beautiful renderings of 18th century sailing ships as well as still identifiable coastal features. Prepared as plate number 25 for inclusion in the 1765 Dutch language issue of Anson's Voyage round the world… The Dutch edition of Anson's voyage is notable for its superior presentation over other editions, including completely re-engraved map plates, courtesy of the Dutch master engraver Jan van Schley. Jacob Van der Schley (1715 - 1779) was a prominent Dutch engraver and draftsman based out of Amsterdam. Schley apprenticed under portrait engraver Bernard Picart, whose style he imitated. He is said to have completed several of Picart's portraits following his master's death. While Schley is primarily known for his work as a portraitist and illustrator, he also has a considerable cartographic corpus. He is known to have worked with Bellin, Hondt, and Provost, among others. Very good condition. Original fold lines. Blank on verso. Platemark visible.